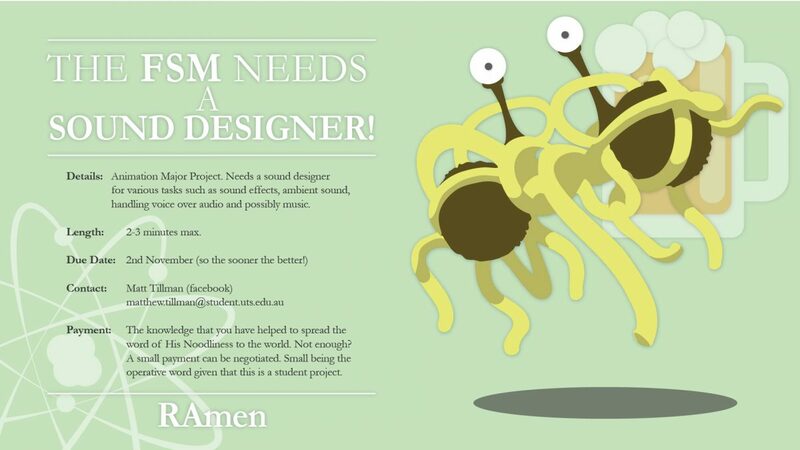 has nothing to do with the Church of the Flying Spaghetti Monster. We hear he crashed a Vancouver pride parade posing as a member of the Calgary Church of the Flying Spaghetti Monster and then passed out anti-gay leaflets. 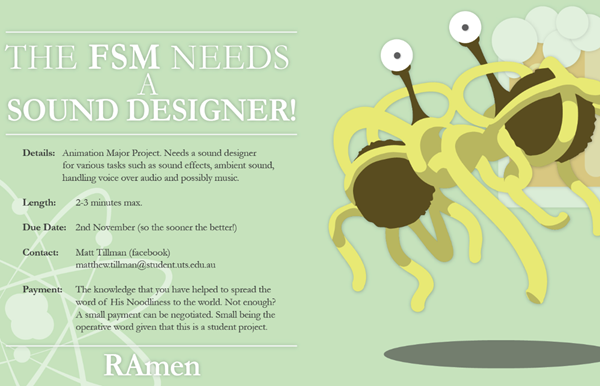 I find it all very sad, and while I hope no one actually believed this douche represents the Church of the FSM, I wonder if there’s anything that can be done to keep him from using our name and symbols in the future. Here’s an article talking about their antics. 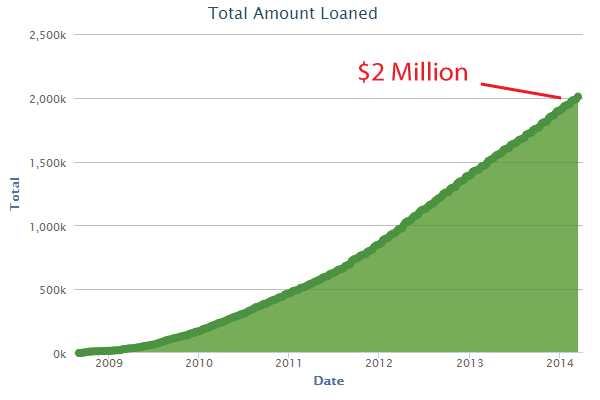 Team FSM has reached $2 Million in loans on the micro-lending site Kiva. 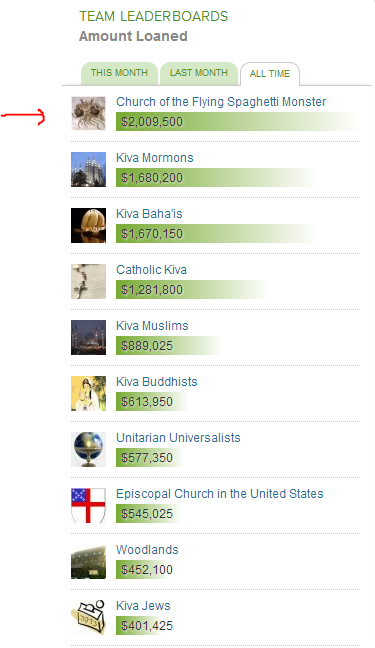 We’re now the top-lending religious congregation on Kiva, above the Buddhists, Catholics, Muslims, and — especially pleasing to me – above the Mormons, who we’ve been in a friendly competition with for years. Congratulations everyone! What is Kiva? Kiva is a platform where you can make small loans to people in poor areas that need help starting small business. We make small, interest-free loans towards the projects we support, and Kiva combines them to fund the loan to the person who wants to build a small workshop, farm, restaurant, fruit stand, etc. These are interest-fee loans in places like Cambodia, Peru, Uganda — places where traditional bank lending to the poor is unavailable (or predatory). Kiva ensures that the loans are paid out and that the money is paid back. A lot of us feel this is the best way of bringing economic growth to the poorest areas. I’ve had a good experience with Kiva and I encourage anyone interested to check it out. And please join our amazing team and help us continue to trounce the mainstream religion teams. I’m looking for a place to co-locate our new server. We need a spot to hold a 1U size chassis, a few IPs, on a fast un-metered connection. I’m hoping to get it settled in the next few weeks. Please contact me if you know of a good deal. Thanks ! The Holy Colander, blessed of His Noodlyness because He Boiled for Us inside it, has once again confirmed its rightful place among the Holiest of religious head garments! 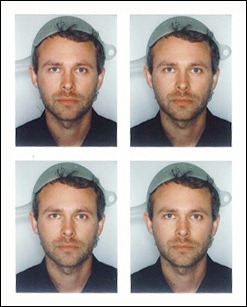 Aaron Williams, an Egg Harbor NJ Pastafarian and Sauced Beyond Marinated, has paid tribute to the just Licencing Laws of New Jersey and honoured Lord Glob by wearing the Holy Colander for a renewal photo. Joining Niko Alm with the desire to etch his devotion to the One True Monster in perpetuity, Aaron insisted that the Colander did not breach the Licencing Law. Despite Aaron Spreading the Truth, the Unenlightened, dedicated as they are to the Law of New Jersey, were compelled to refer this Holy Matter to the State. “What we deem as different or embarrassing is different from what another individual deems as different or embarrassing, in terms of religious practices,” Williams told Patch on Tuesday. “The people there were very polite, but I’d like to have better training for their employees, so I may be looking into some way to educate their employees on their own policies,” he said. “I feel like after I expressed my opinions and beliefs they were definitely more accepting. I was met with hostility at first and they were asking me what my problem was. Here is a link to Davy’s original article. 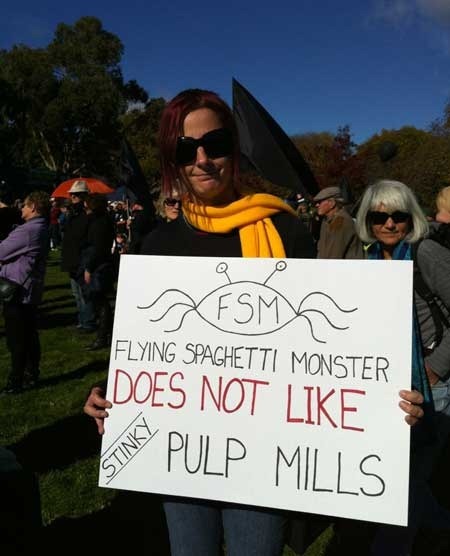 May His Noodlyness Touch the Unenlightened that they become strengthened by Protein, and that the Colander takes its true place not only among the world’s great head garments of faith but on the photo of every Pastafarian driver licence holder! Anyone out there with sound experience and willing to help with a student project? Please get in touch with Matt, details below. Click for big version. The response has been great. Jut a note, for the people who are planning to perform weddings as an FSM Minister: It’s our view that weddings are social ceremonies and a couple should be free to choose whoever they like to perform their ceremony. But to “be married” is also a legal distinction, and for that reason, I want to make sure that our FSM Ministers are following the rules and regulations of their areas. 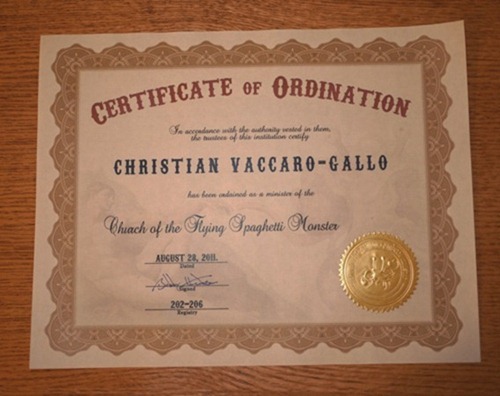 Please be aware that a Certificate of Ordination is not the same thing as a license to officiate weddings. In many areas if you want the weddings to be registered by the government, you need to get a license to perform weddings, issued by your clerk’s office. We have learned that most clerks will accept our ordinations, but if you encounter one who will not, please let me know, and I will see what I can do. But for the most part, please consider these certificates in the spirit of social ceremony. Note — the certificates have been updated to use lithographed certificate paper. We also now have ID cards. 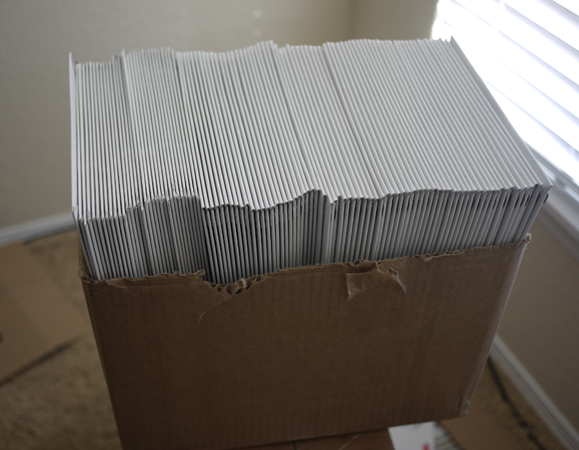 You can order the certificates and cards here. 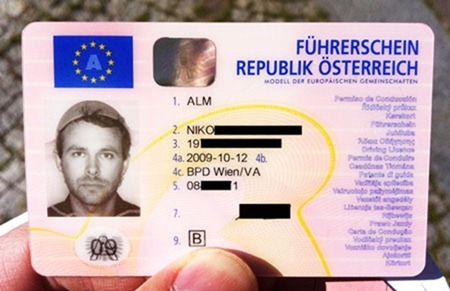 Pastafarian Niko Alm has won the right to wear a colander as religious headgear on his Austrian driver’s license. Congratulations! The Austrian authorities required him to obtain a doctor’s certificate that he was "psychologically fit" to drive. The BBC article is fantastic and can be found here. You can follow the link to (google’s translation of) Niko’s blog: here. There’s something of a troll problem in the comment discussions. I think the BigGest offender has now finally been convinced to find another venue, but there will be more in the future who are bent on being disruptive. Short of moderating all comments before they’re published (meaning it may be hours before they become visible), the options are a bit limited in what we can do. We have a few options but some trolls are persistent at getting around the obstacles. One thing I wanted to make clear is that there is no opinion filter. The whole spectrum of opinion is welcome here – and especially when commenters are representing a minority view (strongly religious, for example) I feel obligated to give them the benefit of the doubt. What I am saying is, unpopular opinions are as welcome as popular opinions, but all comments must be somewhat civil. Commenters who are only disruptive will be asked to find a new venue. This last trouble-maker was ejected because he was trying to ruin the peace (and succeeding), not because he was religious. Many people asking for his removal were in fact Christians who felt he was giving Christians a bad name with his ranting. The question is what to do with the comments left behind. It was argued that we should leave them in place to avoid any precedent of deleting comments. This makes sense to me. For those looking for a more structured discussion forum, the FSM Forums are available and run a much tighter ship. 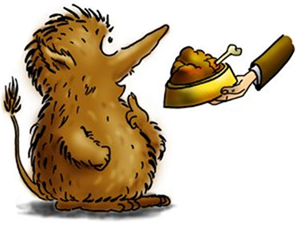 Thanks to everyone for the suggestions about the troll and for your patience.